Do you struggle with the removal of persistent spots, water streaks and grime build-ups from your windows? Do they cost you too much elbow grease and you don't want to engage in this household task? This task will no longer consume a lot of your time and efforts! The professionals of window cleaning in Hadley Wood are going to render you assistance! You will be able to use your leisure time as you wish – the skilled and reliable professionals will deal with the wiping and scrubbing. We deliver impeccable cleaning services for all kinds of windows. Read further and discover more about the different advantages you can have. We also provide our professional services in nearby areas: Enfield Chase, Trent Park, Oakleigh, Cockfosters, New Barnet. Improve the look of your office – the experts of commercial window cleaning will take care of that. As part of our distinctive technique, we use water-fed extension poles. With this technique, we can clean thoroughly the windows from outside of your workplace, as high as the fourth floor. In order to reach highly-rised windows we use rope access. We grant your glass panes will look great, no matter how high is the building. With the assistance of the team of experts London's skyline shall never be dirty. We provide top-notch window cleaning by using next-generation equipment. We deliver gleaming and spotless look for your glass surfaces, skylights and conservatories with water-fed extension pole system and jet washing. The poles we use are connected to water reservoirs in our vans, thus eliminating the risk of damage to the exterior of your home or office. Plus, we use entirely safe rope access equipment to clean glasses on high-rise buildings. You can benefit from these techniques now – phone us on 020 3746 3113! You can count on the abilities and experience of the specialists for cleaning all kinds of windows. The glass surfaces in our competence are: small or double windows, sash ones and bay windows. Of course, if you have French doors, garden windows, conservatory or skylights, we will make them sparkle, too. With our advanced methods and next-generation machinery, we can cope with all types of window cleaning, even with hard-to-reach glass panes. 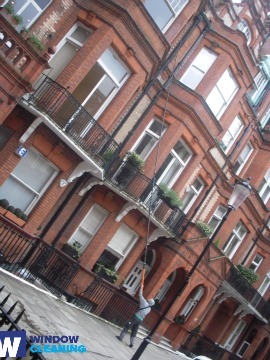 Book our swift and dependable domestic window cleaning in Hadley Wood. We will clean the windows of your house in and outside. The detergents we use are eco-friendly - you will enjoy the superb results and make a green choice. In addition, we use only purified water. Don't delay, ring 020 3746 3113 and order our second-to-none services. Our customer care staff will assist you – they are accessible 24/7. As an alternative ways of booking – our request-a-service online form or just chat with our representatives.